One set of parents asked us to watch their children on Sunday afternoon/early evening so that they could go on a Valentine's date together. So we offered to the other set of parents childcare during the same time. I prepared some craft supplies beforehand and we had fun making these heart-shaped sun-catchers that look so pretty taped to the windows. The two girls, in particular, loved the gluing, the arranging, the choosing of colours and so on. Grandpa helped Felix to create his artwork, and then the two menfolk went off and did other things while the girls continued to craft. Yesterday I baked a batch of sugar cookies, the same recipe that I've used for many years, my mother's recipe. She made heart-shaped cookies for Valentine's Day, and sent them carefully packed, when I was in college. There was a lot of icing consumed, and plenty of sprinkles landed on the floor (and into mouths), and it all added up to a very sweet time - the kind of time I've anticipated as the children grow up. Thank you to all the other Nanas out there who post about the things they do with their grandchildren. I'm inspired by you all. I showed them my collection of heart-shaped rocks and they each picked a favourite one. Miss A was astounded that rocks could be found in such shapes. Next time we go to the beach I'll help her find some for herself. Decorating for Valentine's Day is minimal. I've left the red and white dishes from Christmas in the china hutch, and will take them down soon. I propped up this old postcard, written with a simple "To Bertha, from Grandma and Grandpa" on the back. It's undated, and must have been hand-delivered, for there is no postage on the card, but I have others to Bertha, and they are from the early 20th century. While cutting out simple heart shaped cookies yesterday, I cut a few pairs with cutouts, as well, and put them together with raspberry jam, then dusted them with icing sugar as a treat for the man I love. Tomorrow is a holiday here - how I love Sunday nights with Mondays off. It's Family Day here in our province, and we will be getting together with family once again. Precious shared moments with your lovely grandchildren - you will all remember these happy times spent together - I know because my own grown up grandchildren tell me so. Yes, I too astounded to see lovely heart-shaped rocks. Days like these are memories in the making and I'm sure your grandchildren will look back on them with love and affection all their lives. What a wonderful Nana you are. Good luck with the marmalade making, I'm sticking to Chutney from now on. Happy Mosaic Monday. 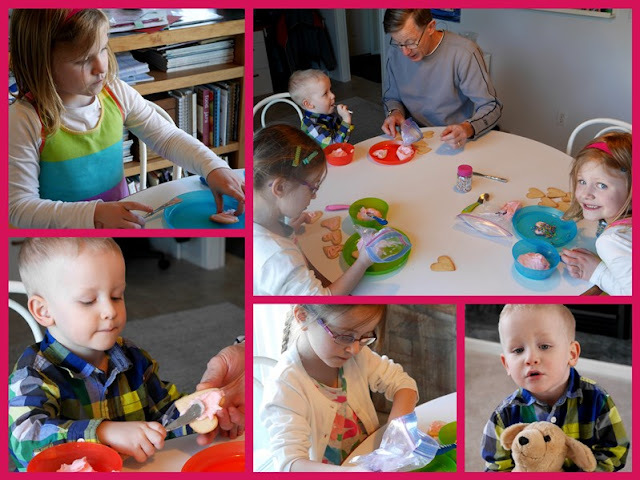 What a fun and creative activity you planned for your grands, Lorrie. All sweet smiles, I see! Your heart shaped cookies look scrumptious. Raspberry jam is perfect isn't it, for such things? I love it in the Victoria Sponge I make. Enjoy Family Day and Happy Valentine's Day! Such a lovely post, it is always so much fun to craft with your Grandchildren and create some wonderful memories for you all to reflect on. 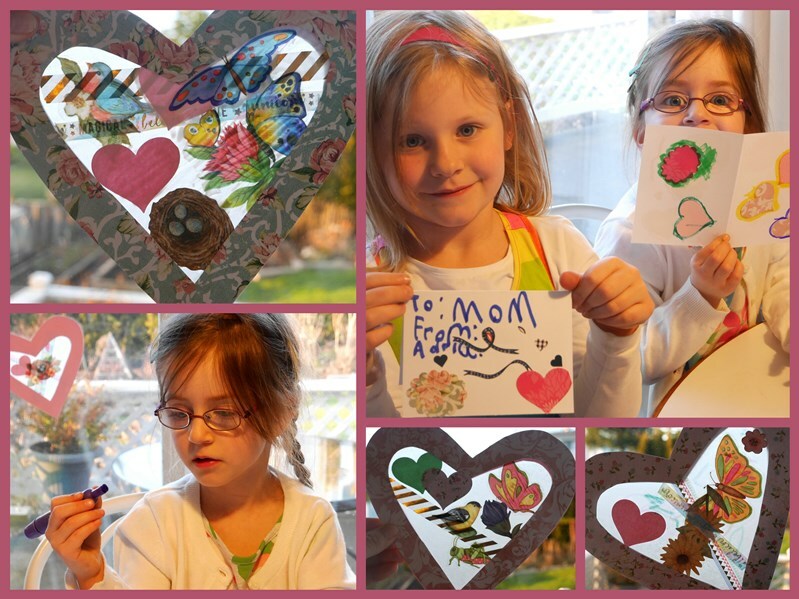 What fun to enjoy Valentine crafting with your grands. Happy Family day to you today. Those cookies are a work of art! What a cheerful, lovely post, darling Lorrie, you're really such a darling Nana !!! I never noticed before this how much Miss A. looks so much like her Auntie A. What great photos of the grands. So grown up already. Oh my. I still think of them all as toddlers. What a lovely post, dear Lorrie. What fun you had with the little ones...and the memories you made are priceless! They are all very creative too! Love your heart stones. I've only found one in our walks on the beach. They are special! Happy Valentine's Day! Crafting with your grandkids is the perfect way to spend Family Day weekend. Our Family Day is next Monday. The long weekend can't come fast enough for me! Happy Valentine's Day, Lorrie! That was fun to see the activities with your grands. I don't remember the baking, although we must have done it but we did make fairy wands and fairy dust pouches to go under a pillow for sweet dreams. The children look like they are enjoying their visit. What cute crafts! Happy ♥ day! What happy little crafters and bakers. It helps them to be able to give such pretty gifts to their parents. Children need that joy of giving. What happy memories you all will share. This looks like the perfect thing to do with your grandchildren. Then sugar cookies, yummm! I use to do that when my children were growing up, but don't usually do it now. No one in my family appreciates having too many sweets. My little guy said he and his mom had made Valentine's, so he just wanted to play with colored paper, cutting it and making hearts yesterday. Oh how cute & pretty & precious little girls ❤︎ Your cookies look so professional and delicious :) Wishing you Happy Valentine's Day Lorrie! Lorrie, That was a good time with grand children and creative projects emerged! I love your cookies with raspberry jam. I was going to make tea biscuits in heart shapes but the water is off this morning so I'm headed out for errands. Thanks for sharing. Sylvia D.
Perfect delights for the holiday! Have a Happy Valentine's Day! May love and joy always be yours. Oh how your posting made me smile. My little granddaughters are 1/2 a state a way and my 4 grandsons all grown up so I kind of envy you your time with yours, just a tiny bit. You're making such good memories, Lorrie. And the best gift you can give to their parents is time for a date! They are are very cute making their crafts! I like your granddaughter's response to the heart shaped rocks! I love those moments when they learn something that makes them excited! So good to see your photo's. I always enjoy time spent with the grand-kids. Those cookies with the jam look so pretty! Did you still use a sugar cookie dough or another recipe? It's so much fun to see the kids enjoy doing crafts. I'm not a crafty person, but I love finding easy ideas to do with them because they love it! I think I need a tutorial for those sun-catchers. Did you use wax paper? Your kids are fortunate to have such great grandparents for their kids! It looks like a sweet and fun time was had by all! They will have wonderful memories of their 'Valentine's party' at your place...and when they are teens they will still want to do those same things. (My 15 year old granddaughters insisted on cutting out finger-jello hearts again this year, like they have since they were two.) Love your heart-shaped rock collection. Beautiful post. Your grandchildren are so precious. Making valentines with them was a joy I know! I got to do that a couple of weeks ago. I don't think I took any pictures tho. Should have!!! Lots of goodies in your Valentine celebration! * yet another reason for me to wake up wondering why my grandparents settled south of our border instead of in BC like my great-uncles.... (only half kidding). Your grands are so precious, and I know you must enjoy them immensely! Your post made me thankful for all God's good blessings and His love for me in the form of my own family. :) Since I am working backward, I also enjoyed the post of Mr. F's 3rd birthday, and yes he did look quite pleased that he was being sung to! How blessed you are to have your Grandchildren so near and available.